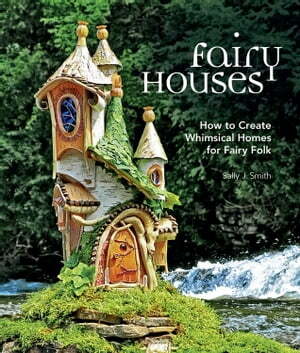 Collins Booksellers - Fairy Houses by Sally J. Smith, 9780760354834. Buy this book online. **Add an exquisite flourish of design to your beloved green space or garden by adding tiny fairy homes inter-woven with nature. Fairy Houses gives you the instruction and inspiration you need to start! Have you ever seen a real fairy house? Not the ceramic ones at cavernous home improvement stores, but a real fairy house made from natural elements? Well, now you can build your own miniature magical abode - the perfect addition to your garden. Step-by-step instructions for constructing exquisite fairy houses are revealed in Fairy Houses, explained by master fairy house architect Sally Smith. Smith has been creating one-of-a-kind DIY fairy houses out of natural artifacts for years, now she passes her miniature construction knowledge to you. Imagine, a fairy garden with homes that have butterfly wings as stained-glass windows, twigs for window frames, birch bark for walls, dried mushrooms for shingles; it's all possible with a little instruction and inspiration from Fairy Houses. Begin by flipping through an inspiration gallery, find which elements appeal to you, and how they fit together. From there, you’ll learn about building materials (found and natural), on-site fairy house construction, and how to light a fairy house.